As I said in the subject of my e-mail, did you ever have the feeling that all this trading business is only a f… casino? Time and time again I lose all my money in these damned markets. I get only a few wins and a lot more and bigger loses, till finally I'm running out of money. Is this not the same way a casino is operating, I mean stealing your money bit by bit? Except that I feel that Forex is a dirty game, just like the dirty tricks on a casino: running stops, false breaks, traps etc etc. Do you have any suggestion for me? Except that thank you very much for all the content of your website. I can only assume you've never read the YTC Price Action Trader! 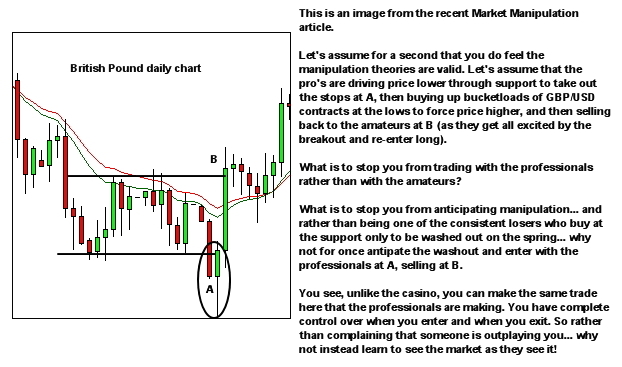 I can also assume you've never read this article (http://www.yourtradingcoach.com/trading-process-and-strategy/rock-paper-scissors-a-trading-analogy/), or if you did then I failed in my ability to get the point across. It's not a casino. The market is a different game. But like the casino, the uninformed public will end up the loser. Like poker, where you're playing against the other players, the funds will flow over time from the less skilled players to the more highly skilled players. At the moment you're playing the game. But there's a deeper level game-within-the-game that you're not yet seeing. The market is not rigged. It's just that you don't yet know how it really works. But since you do feel that you're the target of manipulation, let's assume that this is the case. Let's assume for a second that it is a rigged game and the casino is running everyone's stops. What's to stop you learning to see the market in the way the professionals do and trading alongside them. Unlike the real casino, you can do that in the markets. There are no restrictions on when you can buy or sell. Learn to see the market the way they do.